When it comes to impressive things about Egypt, most people know about the pyramids and there is definitely a lot of focus being placed on Cleopatra too. When it comes to characters from history, Cleopatra has a story that is second to none and there are definitely a lot of tales about her beauty and the power she displayed. This provides an excellent opportunity for casino operators to create casino games around and there is no doubt that Cleopatra’s Pyramid is one of the obvious choices for slots lovers that adore ancient Egypt. The game is provided by Vegas Technology, who may not be a casino name that everyone is familiar with but on the basis of Cleopatra’s Pyramid, they could well be a name to be reckoned with. While the standard casino option is still the 3 reel and 1 pay-line game, there is a lot to be said that 5 reel and 20 pay-line game is the most common slots option you will find these days. 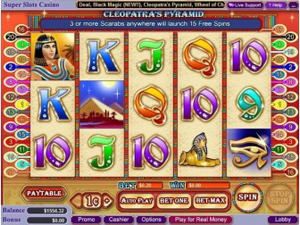 This is what is on offer from Cleopatra’s Pyramid and it provides a number of ways to be a winner. The coin value for the game ranges between $/£/€ 0.01 to 10 and the maximum number of coins that can be played in an individual game is set at 20. The maximum amount of money that can played each spin is $/£/€ 200. Cleopatra’s Pyramid provides a number of different bonus options and rounds but any player looking for a progressive jackpot will be left disappointed. There is no progressive jackpot on offer and while this will be of interest to some players, the more casual casino player may decide to play other games instead. Even though the odds of getting a big win when playing on progressive jackpots are slim, many players cannot help be drawn to them and the slim chance of winning a life changing amount of money. You will find that Cleopatra herself is the Wild Symbol for the game and the scarab, the ant like creature commonly found on amulets represents the Scatter Symbol. Any player that picks up a minimum of three Scatter Symbols will find themselves entitled to 15 free spins, which can certainly provide a cost effective way to play this slot game! Cleopatra’s Pyramid is a very bright and colourful game, which is likely to be welcomed by serious slots players and casual gamers alike. The fact that there is a very strong visual link to the known elements of Ancient Egypt and the characters found in this game will help to entice everyone in to what is on offer here. 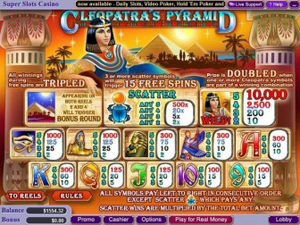 Players looking for an innovative slot that ties in with the theme of the game will be delighted to know that Cleopatra’s Pyramid is the setting for the bonus round. Players have to turn over the bricks on the pyramid knowing that a confrontation with an asp sends them straight back to the game.